A simple looking, mysterious man, known by the name of ‘The Professor’ plans the biggest heist in the history and recruits a team of eight having an individual skill or ability to perform the difficult task. Their aim is to get into The Royal Mint of Spain where the national currency gets printed and then escape through a hidden tunnel with the maximum cash. Frankly the above synopsis certainly sounds clichéd reminding you of several heist movies and their interesting plans. Plus the 21 episodes series also might appear to be too long for a heist genre most likely to have all familiar and predictable stuff. However, would love to inform that MONEY HEIST rises much above the usual heist movies and their stereotyped story progression, since the plan is here not to just grab the cash already lying there but excitingly something else. Yes, the series is long, at times stretched, with a few questionable loopholes too in its brilliantly executed plan. But at the same time it’s also fresh, engaging and inventive enough for a binge watch, without wasting any more time in giving it a second thought. As a glimpse of the content, the heist is actually more than a week long task involving intriguing games being played between a mastermind criminal, his operating group and the police officials resulting in a great show. Despite having so many characters in the script, the writers still manage to give every single character his or her respectable screen-time and opportunity to stand out pointing towards its powerful concept. As a matter of fact, the cat and mouse games between The Professor and the Police Officer, and the suspicion of getting caught constantly changing in every single episode readily reminds you of another killer show BREAKING BAD - proving its true value or worth. The sequences keep you guessing and the momentum keeps escalating (despite a few avoidable hurdles), heading towards a thoroughly entertaining as well as pulsating climax. Besides, the cinematography, arti direction, and background score is simply first rate and performances make it look so believable, compelling you to keep on watching to know whether the team succeeds or not. 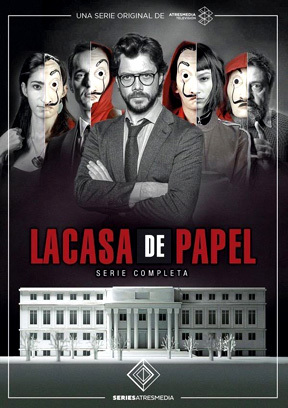 Sharing the details the series is originally in Spanish titled LA CASA DE PAPEL (meaning The Paper House) and its also available in a dubbed English version as MONEY HEIST. But I would strongly suggest to watch it in its original Spanish language with English subtitles. As an interesting backstage information mentioned in its IMDB page, originally all the participants in the heist were supposed to have terminal diseases giving them a valid reason to go for the highly risky plan. But somehow it wasn’t incorporated. On the other hand, the creators very cleverly go for one common mask for every person in the team hiding their individual identity, which happens to be comical face-mask of famous Spanish painter Salvador Dali, who was known for his bizarre and unusual imagination, cleverly pointing towards the games being played by the Professor. Created by Alex Pina, the series is at present Netflix’s most watched series in Non-English category. So don’t miss it for any reason, especially if you are a fan of the Heist genre. The much appreciated series has its own share of imperfections and issues (including being strictly for adults), yet it is sharp, witty, fast paced and intriguing enough to be watched having a great time. Tags : MONEY HEIST (Netflix Series) Review by Bobby Sing at bobbytalkscinema.com, Must watch heist series, Movies To See Before You Die Thriller, Not To Be Missed Heist Thrillers.